skóra is a polish word that means “skin” or leather” and is used to represent the brand’s next to skin style. 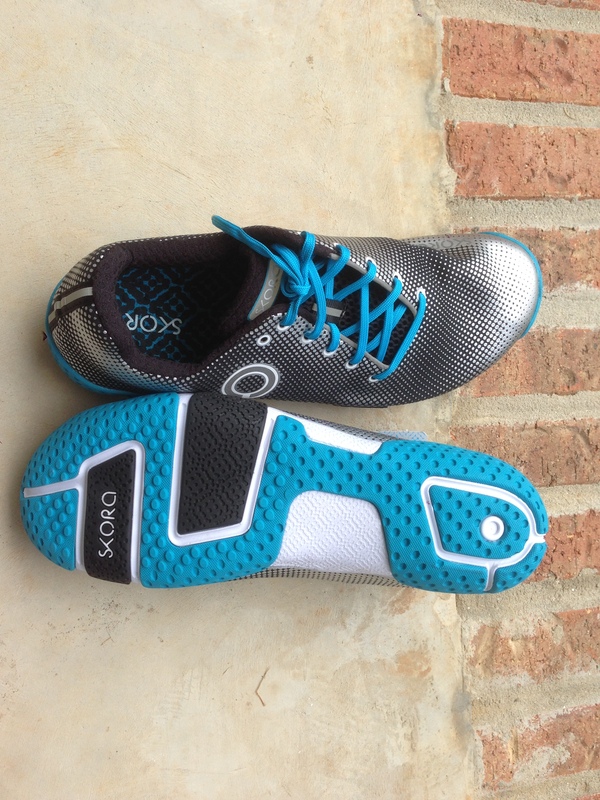 I first heard of Skora shoes back in 2012 when my friend Mike, the Dirtdawg, reviewed one of their early iterations and interviewed Skora CEO David Sypniewski for his podcast. I enjoyed the interview and thought the review informative, but at that stage in my running shoe knowledge I assumed that if the shoe wasn’t made by one of the “brand giants” and didn’t have three inches of cushioning, then it wasn’t to be taken seriously. Such was the nature of shoe marketing and advertising, especially in the publications that new and veteran runners seem to gravitate: Runners World and Running Times. I mean seriousy, back then I thought if your ad didn’t appear in those “sacred pages” then why even try. Stupid and naive was I, no? Fast forward a few years and the running shoe market is replete with big brands, small brands, brands that climb on rocks. And the cool thing is each brand has its niche. Each brand has a core audience; a mission, as it were, for the runners who lace up their shoes. The upper is made of a seamless piece of stretch airmesh with 3D printed colorways and graphics. It has no tongue and no exposed seams and feels great if you run without socks. Frankly, I think running in these with socks (unless you’re on a trail) kind of detracts from the experience. 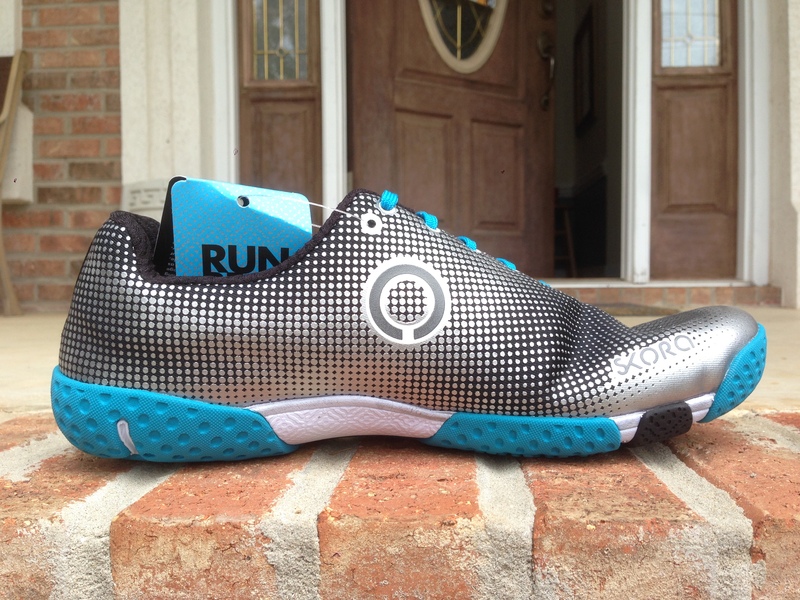 Of course, this is a zero drop shoe, with minimal cushioning and with a wide toebox for the splay (I plan to use this word more in my everyday life) of the toes when you run. Skora prides itself on constructing shoes that follow the anatomical patterns of the foot. The laces are offset to follow the contours of the top of your feet, and the front half of the shoe curves inside slightly in the same effort to follow the natural shape of the foot. The Skora website has a nice illustrated discussion and explanation of their construction. View it here. 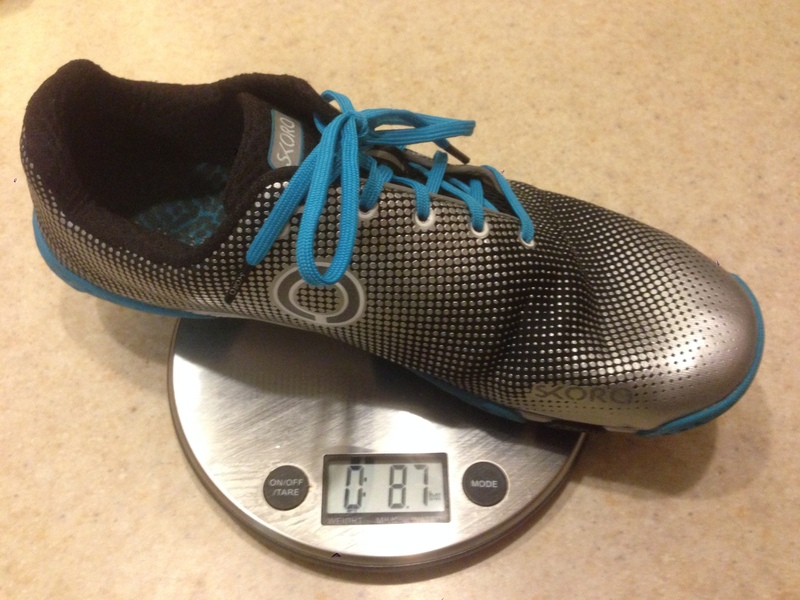 I weighed one of my Fits and it is a light shoe–8.7 ounces. And I wear 11.5. Many shoe brands will give you the weight of a smaller sized shoe in order to highlight the lightness of their particular modelas, like a size 8 or 9. But their larger shoes are heavier than advertised. Skora’s are light throughout their sizes. I figure if your shoe is light in size 11 or higher then you have a truly light shoe for ALL wearers. The Fit does this well. There’s not a lot to these shoes, and that’s by design. No doubt you’ve seen reviews where people have literally folded the shoe into a 3 inch mass of rubber and fabric. Skora prides itself on shoes that let you run naturally, without interference by technology or a design that forces you to run in a way that your body wasn’t meant to move. The Fit has minimal cushioning, mainly along the balls of the feet and the heel–just enough that you don’t wince with every pebble you meet on the road. But minimal enough that you feel more in tune with the road and with how your feet and legs work as they strike the pavement, and you run, as Skora asserts, more natural and less manipulated than a shoe with control. The outsole is a pretty dense EVA that Skora says a tester once ran 1,300 miles in, but that’s an extreme number. 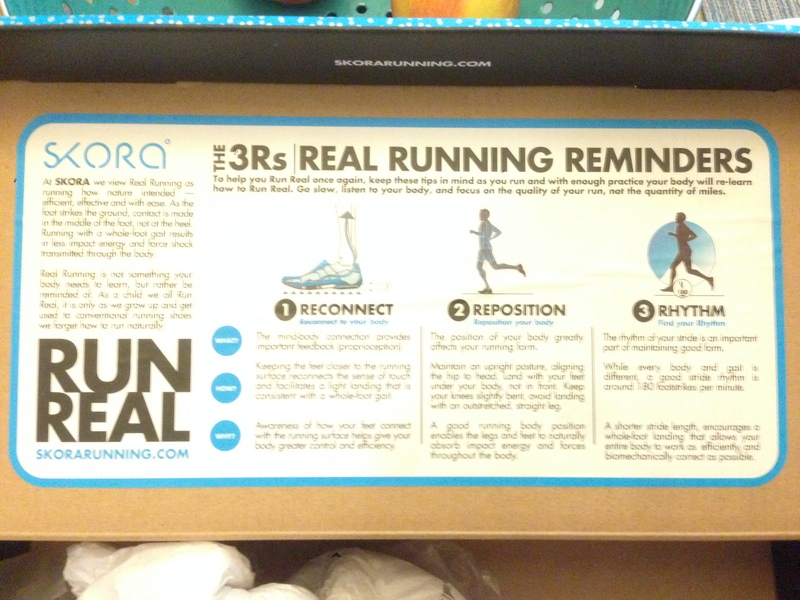 Skora says you should get anywhere from 200 to upwards of 500 miles out of a pair. I wore the Fit on recovery runs and short sessions at the track. Since I run in shoes with a decent heel-to-toe drop, I dosed the Fit on my runs. Always a good idea to do this with any shoe that departs from what your body is accustomed to. I also wore the Fit on shorter runs as I recovered from surgery this spring and tried to reconstruct my running form. Eight weeks off is a long time not to run and I felt as if I was starting over. I wore the fit on those runs where I really paid attention to form and the technique of the type of runner I want to become. Research shows that it is highly advisable to run in a variety of shoes with differing heel drops, control, and cushioning, so as to work all parts and muscles of the foot and stave off injury. If you’re looking for minimalist shoe for this purpose, you would do well to give the Fit a try. Since there’s little to the shoe, it “feels” fast. And running with it on the track gave me the sensation of what it might feel to run with track spikes, minimal shoes that give you just enough protection and grip to run fast. I wear the Fit EVERYWHERE. They are comfy and light, easy on and off without even lacing. And walking around in shoes with little “correction” to your form strengthens your feet and makes you a better runner, I’ve always felt. So the Fit has become my go-to shoe for everyday wear. I’m wearing them now at the ballpark as I type this review and my son attends baseball catcher’s camp. Thanks for this review. 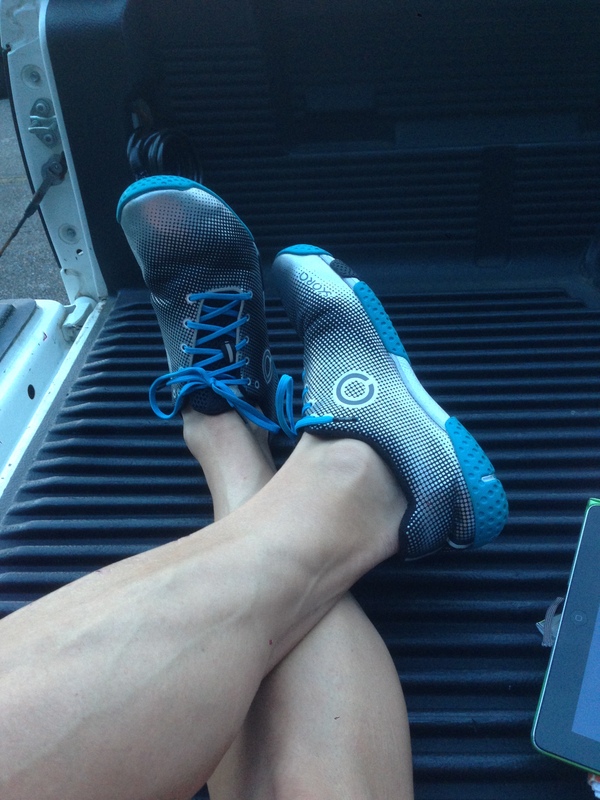 I have a pair of Phase that I use on a rotational basis for my shorter runs. I like them, but I think I would like the Fit better since they have laces. Some of their other shoes are made with goat skin which I will not wear. Glad to see that the Fit is made with man made materials.